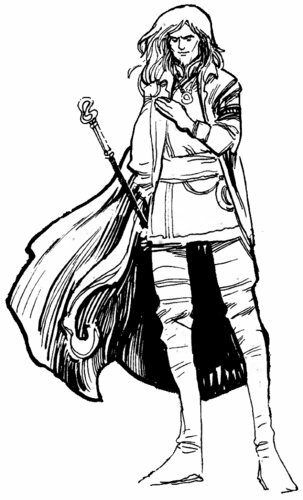 First Encountered: 5.4 "The Grapes of Sorrow"
Description: An ordinary-looking man wearing gray robes of a vaguely Hittite design, with a gold filigree armband. His thinning, gray hair was kept in a tonsure, while the gaze of The Librarian was disconcerting, as his eyes were solid green (until he learned of his death, at least). He wielded a rod of jet and Orichalcum with which he could emit beams of green light capable of harming even monsters of the Abyss. Info: Centuries ago, he tripped and fell and broke his neck. All his power could not save him. As one of the last sages of Iram, he felt compelled to remain and pass on the legacy of the City. In Spirit, the Librarian walked the corridors of his libraries, walking forever from one to the other of his shrines to knowledge, unable to leave. He was in a deep state of denial about his death and fanatical about passing on his teachings, as long as it was to the worthy. Upon learning that he was no longer alive the entire city began to quake, however, and the ghost itself writhed and suffered as phantasmal abyss-bugs began to gnaw at his ectoplasm for a short while, before he regained his composure. He claimed that his belief in his own existence was the only thing keeping the place from falling to the abyssal Acamoth which besieged it, C'Desith. With the help of Dorian the Librarian was able to postpone his inevitable ''moving on'' to the hereafter for just long enough to assist the cabal in both escaping from said monster and in saving the city and its treasures.